At this point, the only way to describe this diamond is… Kyrptonite. The color is so remarkably green. The remarkable florescence makes it quite difficult to photograph – although the pictures do give a pretty good idea. 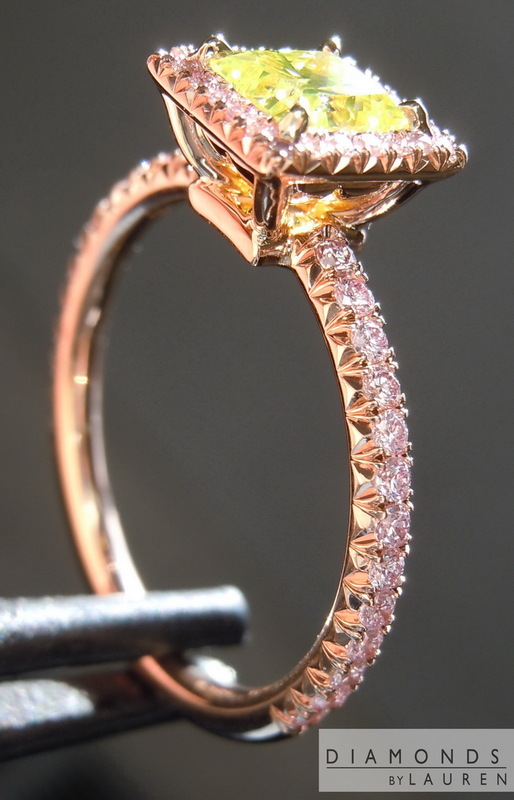 The Uber guys did an amazing job with the pink gold halo ring. 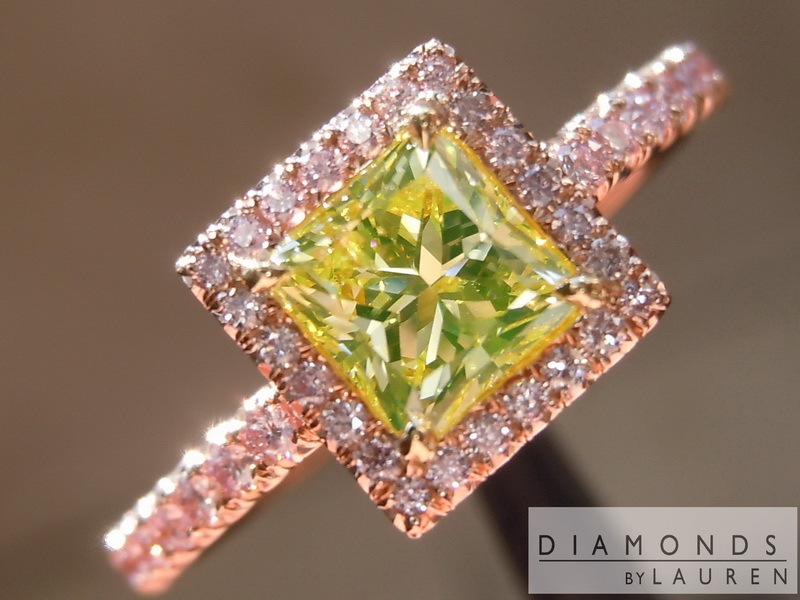 It accentuates the color and the shape of the stone beautifully. 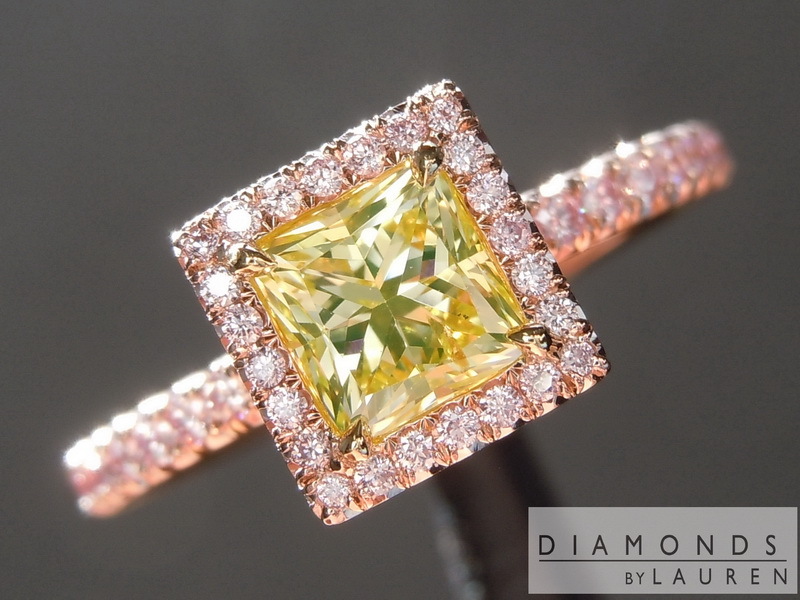 This is a truly remarkable diamond in terms of its color. 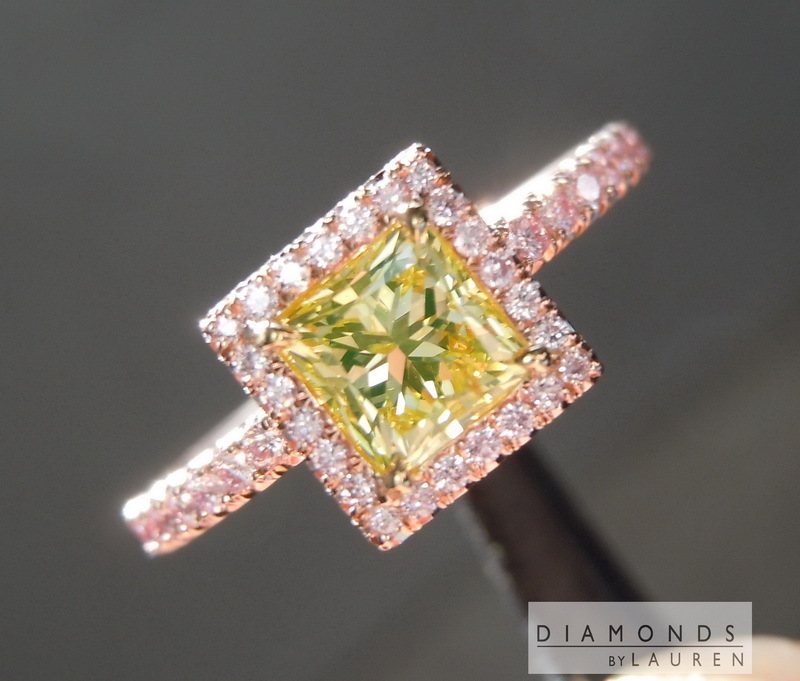 Although, one cannot consider the color of a diamond in the world by itself. That is to say there are other characteristics that combined with a diamond the body color to make it stand out... or a dud. 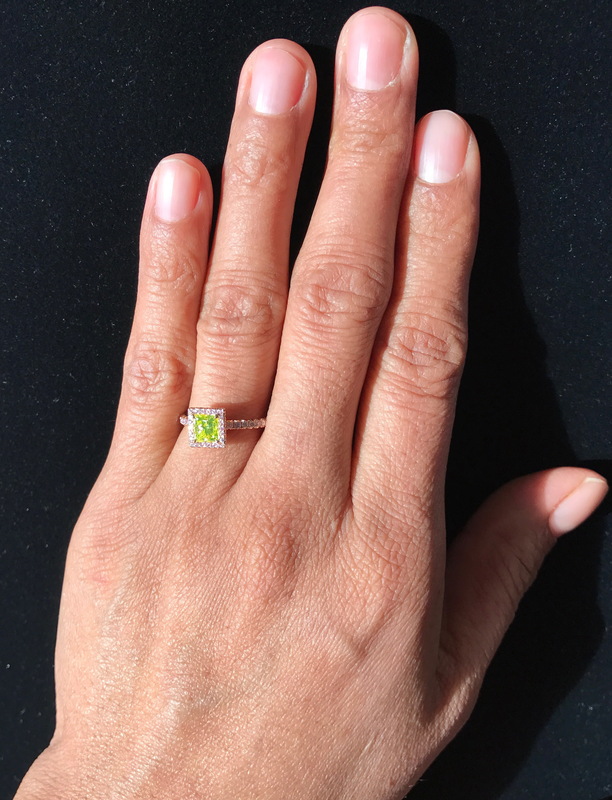 The thing that makes this diamond so incredible in my eyes is the fact that is bright green. 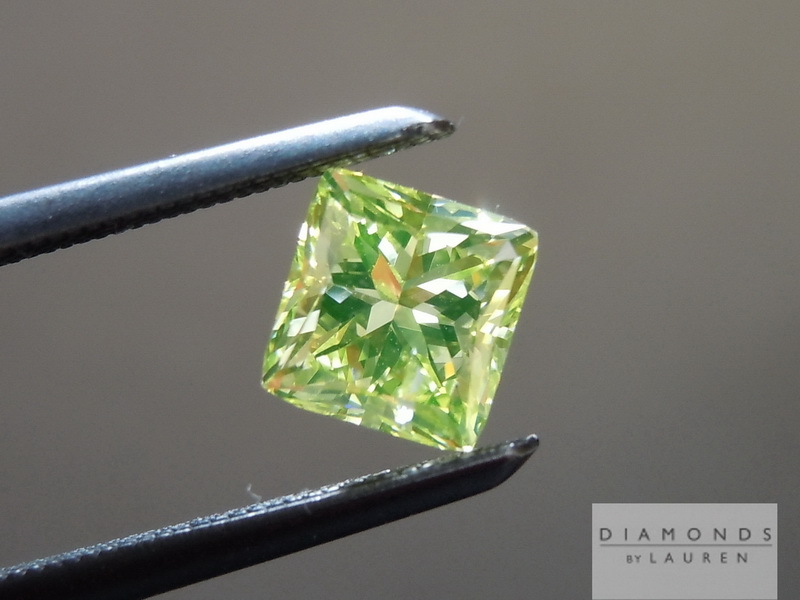 Green is one of the rarest colors in natural diamonds. 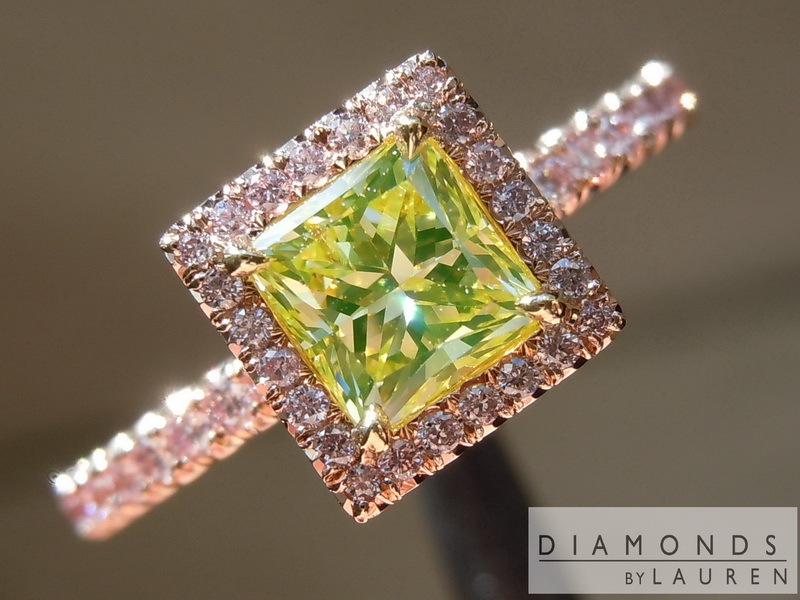 Since Green is a desirable color, this affects the price – of course making pure green diamonds just as costly as natural blue diamonds. 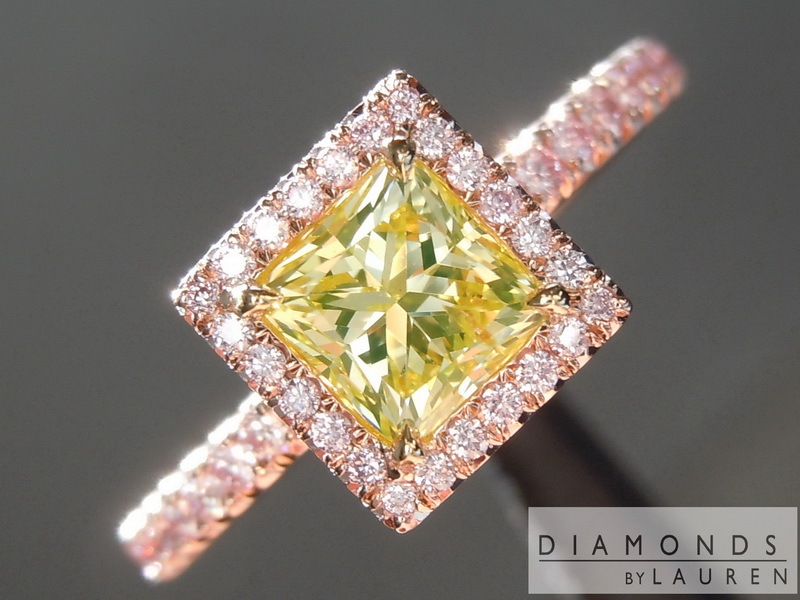 The yellow in this diamond makes it far more reasonably priced than if it were predominantly green. 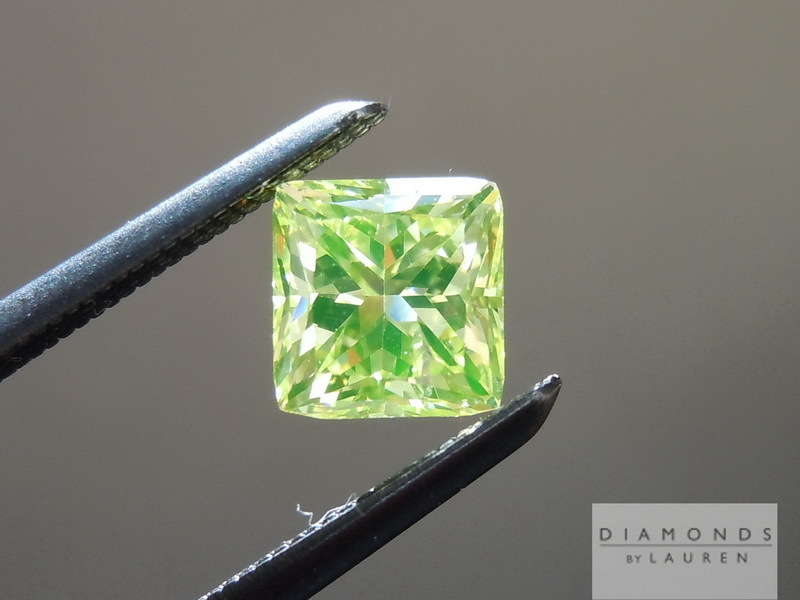 At the end of the day this diamond is veryr green which makes it remarkable. 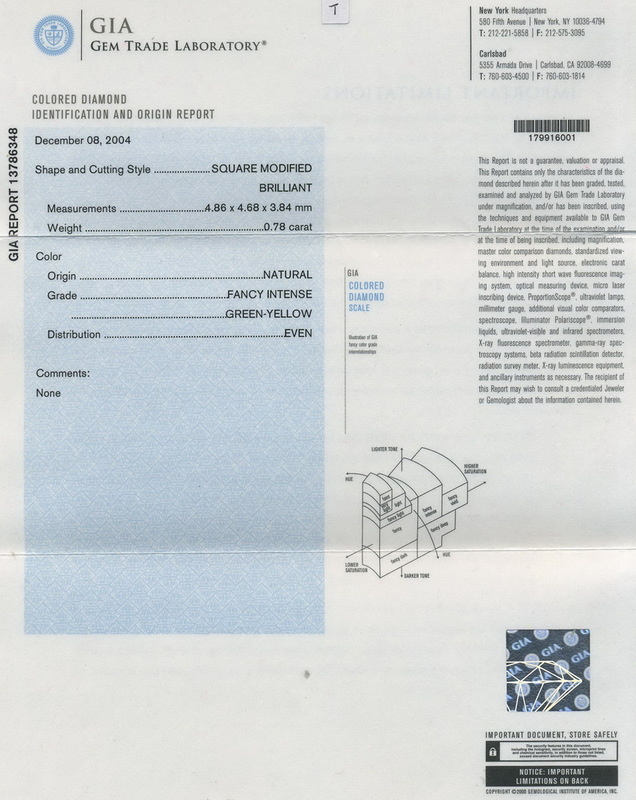 I have graded the diamond I1 Clarity Diamond as it has a GIA report for color only. You can see the white (well it would be white in a white diamond) imperfection in a few of the photos. A sharp eyed person may be able to pick it out but most people would not. 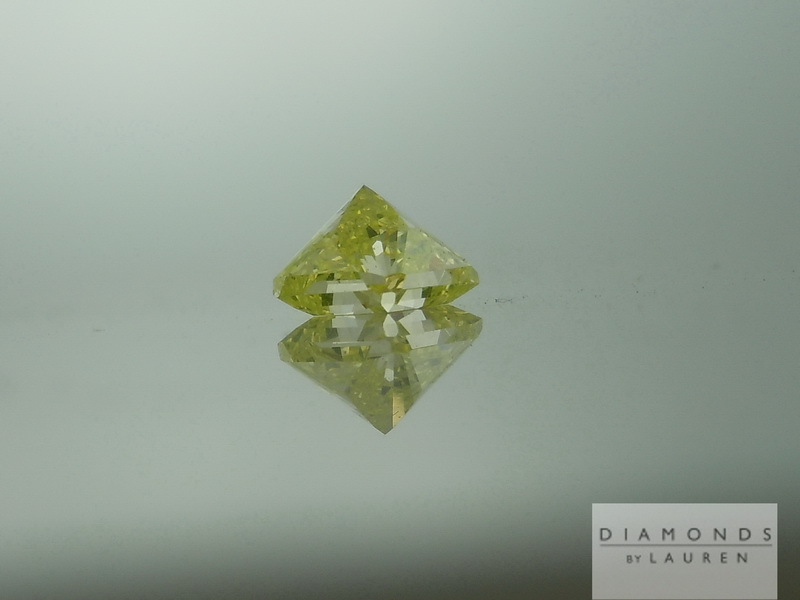 The GIA report also does not mention fluorescence, and I have graded the diamond strong yellow. However, looking at the photo, it looks more like a strong blue. 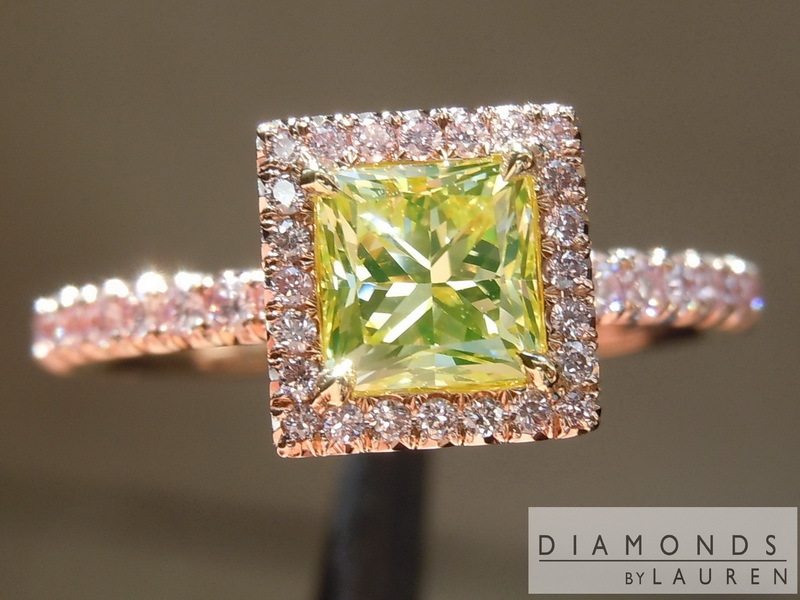 Regardless, this fluorescence is integral to diamonds color in the best possible way. 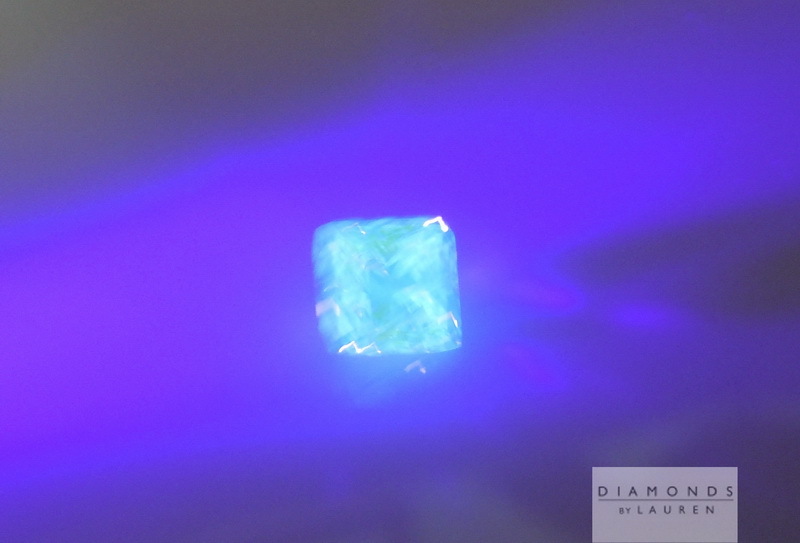 The stone remains very brilliant in spite of the help it gets from this fluorescence.